Starting from: Ask us for the potential starting points. This price is for an adult. Children 0-4 years old, are free. Children 5-12 years old, pay 1/2 of the adult ticket price. Driving along the North East coast and through the gorge of Saint George we arrive at the pretty, cosmopolitan town of Ayios Nicolaos which lies on the shores of the Gulf of Mirabello. Ayios Nikolaos is famous for its picturesque ‘bottomless lake’ and it was here that the well known film “The Lotus Eaters” was shot. You will have plenty of time to discover this pretty little town on your own, to stroll around the shops or just relax in one of the popular cafes and watch the world go by. Leaving Ayios Nicolaos, and after a short coach trip and a photo stop, we arrive at Elounda, once a fishing village but now, after having been discovered by tourism, a famous resort with the most five star hotels in Greece. 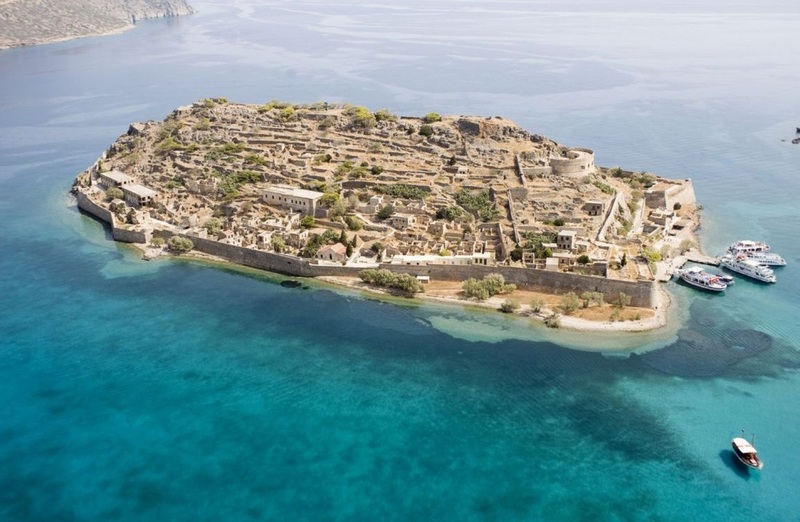 From here you take the boat and cruise along the bay to the island of Spinalonga (sometimes called the island of Tears). The guided tour on the island will both fascinate and haunt you as you learn the tragic history of this island which was once a Venetian fortress and was then the isolated home of many lepers up to 1957 when it was cleared by the Health Authorities, leaving the place uninhabited. The Venetians constructed a very impressive fortress with forty cannons which has been guarding the strategic bay of Mirabello since the 15th century. We get on board again and head for the sandy bay of Kolokitha. Here you will have time for resting or swimming in the crystal clear waters while, in the meantime, the BBQ will be cooked by the crew and the captain himself. It will be served on board at just the right time. The boat will take you back to Elounda to take the coach for the return journey after a fantastic day.